I was SO glad to find out that it’s not a Taco Bell! Looks good – will check it out soon. What an great addition to our area. Had an amazing meal and can’t wait to go back. Try the turkey club, roast beef, scallops and fried clams. All favorites of my family. Yummy! The pulled pork & roast beef sandwich was great. Also tried the fried clams — Awesome Will be coming back for more! The service at J Quick Kitchen is fast. The seafood, roast beef, and chicken are second to none. The chowder was awesome…I can’t wait to go back for more. Oh and I can’t forget the hand cut fries. Tried the scallops and reuben sandwich – both were great! The handcut fries and onion rings are amazing. The Boylan soda fountain is like nothing I’ve seen before – loved the selection, especially the cream soda!! The clams were so tasty, the roastbeef, moist and enough for two. The chicken sandwich was a healthy persons dream. My boy’s and I can’t wait to return. Great food (I am hooked on the Crispy Haddock Sandwich and Creme Soda). Refreshing decor and very helpful staff. Another winner for Joe and Erika!! Our entire family loved the haddock and scallop plates. The fries are terrific and burgers were fab!!!! Try it – you’ll love it! I thought the place was a Basking Robins when I first drove by. Not impressed with this place. The portion size for the $7.50 pulled pork sandwich was very small and came with no sides. My childs meal was also tiny and over priced. The only bright spots were the fries and soda. They should have put in a drive through; the inside is kind of weird. To sterile- not cozy or inviting at all. With all of the other new restaurants in the area, I doubt we will go back. 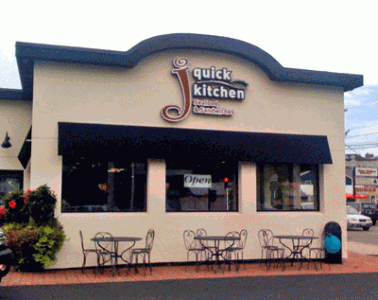 J Quick Kitchen is a much needed addition to the area. Everything we have tried has been excellent! Definitely worth checking out. The soda fountain is worth the trip alone, for sure. The best root beer I’ve had in some time. I tried the roast beef (three way) because any self-respecting north shore sandwich shop should have a good roast beef. J Quick’s was respectable…clearly the components were high quality but I thought the beef was a bit too well done (I like it on the rare side) and kind of dry. The fries were delicious. In all, definitely will go back and try some of the other recommendations. I can’t wait to go back! My kids had the chicken fingers and said there were the best they’ve ever had. Kid plates come with corn on the cob too! I had the veggie burger which was excellent! The fries were great too – old fashioned thinly cut fries – the best! They are doing it right. Oh, and the soda fountain – best cream soda!!! Really great! My boyfriend and I had fried clams and scallops and they were fresh and not heavy on the batter. The onion rings were thin and crispy – delicious. Soda fountain is a great addition, we loved the root beer! Stopped by and tried the haddock sandwich, it was outstanding. Onion rings were great too. It’s about time we got good quality food in the area. Not that impressed. Very small portions and I thought the people were rude. The place was dead and I had a question about one of the items. The guy making the food was a jerk about it. Won’t go back. With the tiny portions, high prices and lack of customer service there’s no way this place will last. Very impressed, good size portions and very friendly staf. They seemed busy yet very attentive, especially the guy making the food. This place is a home run and should be very successful. Wow! Went there for lunch with my friends today and there was a line out the door. Didn’t take long to get in though. The people were all smiles and the manager was greeting people at the door. I had a roast beef and fries, my friends had a veggie burger and the buffalo chicken wrap. The soda fountain is amazing and we all split an onion ring which was more than we can eat..Sooooo good! We can’t wait to go back. We go to Salem State, so it’s a perfect place for us to get a “quick” bite to eat. Will spread the word although from the looks of it they don’t need my help. The food is great! I have been been there a couple of times now and both times exceeded my expectations. 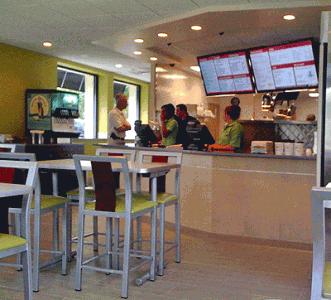 First visit, I had the portabella mushroom burger – fantastic! Second visit was with a friend and we tried the seafood combo (shrimp and scallops) and the roast beef blue cheese salad. Both were incredible. The seafood is fresh and the salad had warm freshly sliced roast beef. What a great place to have in the neighborhood. Looking forward to going back soon. What a fantastic change from the usual !!! The service is fast and the food is great. This ain’t fast food, but it is good food fast. Had the Chicken sandwich. Quick and tasty. I really like the fountain Cola. More places should offer it. I went to J’s last weekend with the family for dinner. Everything was great. I had the pulled pork sandwich. The meat was tender and thankfully it is not served swimming in sauce. My wife loved her chicken sandwich. My daughters both got the roast beef sandwich meals. Normally they eat half of their meals when we go to a restaurant. They would not let us leave until they finished everything. The fries are delicious too. I felt that the value was very good. A great addition to the area. WASN’T IMPRESSED, CHICKEN WRAP SOGGY & FLAVORLESS, CHEESEBURGER TASTED LIKE IT WAS STEAMED IN A BAG.IT DEFINITELY DIDNT LIVE UP TO THE HYPE. I have become a regular at j quick because the food is consistently good and quick. Their roast beef is honestly unbelievable. I absolutely love the onion rings and soda fountain. If anyone says anything negative, don’t listen because this place is great!! My daughter begs me to go for a kids meal….It’s a bargain for what you get..